Young Influence – Exploring the stories of innovators, entrepreneurs, and creators in our community. Vince Kozar, Chief Executive Officer of the Phoenix Mercury, stopped by to discuss what it’s like to run a professional sports franchise, and lessons he’s learned along the way. Additionally, hear some tremendous stories, including his trip to the White House to meet the president. Abigail Olaya, owner of the Grove, a wedding venue in Phoenix, AZ. 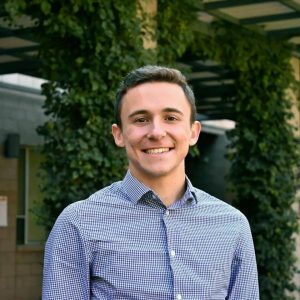 This podcast features Chance Butler, a financial advisor and entrepreneur from Queen Creek, Arizona. Hear his incredible story about how he took a childhook full of illness and staying home from school, and used it to learn investing from his grandfather and turn it into the business he now has today. This podcast featured Jeff Kunowski, a 29-year old entrepreneur from Phoenix, AZ. Hear his incredible story, and how he took an idea of “lighting up” the sign-spinners on street corners at night. Now, he’s working with professional sports franchises all over the country and partnering with one of the biggest electronics companies in the world. This podcast featured Dallin Harris a 32-year old entrepreneur whose company has already created over 500 custom websites for companies like American Express, Lifelock, Blue Media, Banner Health, and even the Super Bowl, when the Super Bowl was in Phoenix. Hear his incredible story, from starting a company at age 23, and what keeps him so driven today. What the hell is this “Young Influence”? Young Influence was created to highlight some of the incredible stories from young entrepreneurs, innovators, and creators, that you may not otherwise ever hear about. They’re here to tell you their stories, and inspire others like you. A lot of times we just see the success without fully understanding how a person became the person they are. We will be uncovering these personal stories with the innovators themselves, in candid interviews. Together, we’ll be exploring the stories of people in our community. They may not be famous (yet), but they are well on their way. To submit someone for Young Influence, simply fill out our request form. We’d love to hear from you! Also, guys, let’s be real. Provide us feedback on how we can improve our storytelling. You already rock for being here!